Walking is a must for all of us. But sometimes, it gets difficult to walk. One common reason for this is that cracked heel of yours. When your feet are cracked, it’s difficult to walk or even wear shoes. Cracked heels get some support to become more severe from some diseases like diabetes, eczema, thyroid etc. But the question is, how to heal cracked heels? Sounds troublesome? No need to worry. Where there’s a problem, there’s always a solution. We are here to help you with some suggestions that will help you heal cracked heels faster. Here are the 5 best and fastest ways on how to heal cracked heels. If they’re not cracked yet, you’ll know how to prevent them from getting there. It may sound weird, but Banana is a good remedy for your cracks. It also softens your heels. 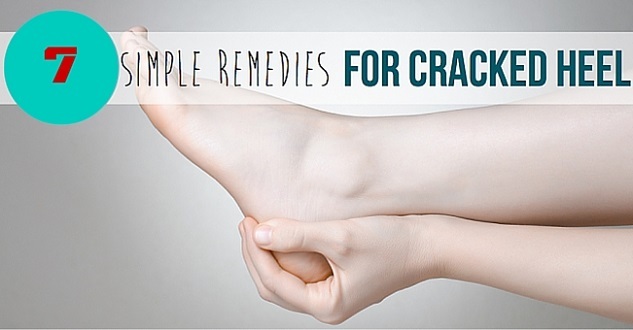 It’s the easiest, cheapest and most effective way to heal cracked heels. First of all, take a ripe Banana, eat it, but don’t throw away its pulp. Apply the pulp on your cracked or uncracked feet. Rub it on your heels and soles. Keep the rubbed gist for 10-15 minutes. It’s an easy and effective way to heal cracked heels. You just need to put some ingredients together and make a mask for your feet. Basically, all you need is warm water. Add 1 tsp each of Salt, Lemon, Rose Water and Glycerin to the warm water. Put your feet into the water and relax for the next 15-20 minutes. It will create a peel on your feet. During this time, scrub your feet gently. After 15 or 20 minutes, wash off your feet with clean water. Vegetable oil is good at healing and prevents cracked heels. Coconut Oil, Sesame Oil, Olive Oil or any hydrogenated Vegetable oil is good for the health of your feet. At first, wash your feet with soapy water. Then scrub and clean your feet. Dry your feet. Apply any one of these oils on your feet and soles before going to bed and leave it for work. Put on a pair of socks to keep everything in place. In the morning, you’ll find your heels better and softer than before. Use this method until your heels are totally healed. Glycerin is a common remedy to heal cracked heels. As cracks mostly appear because of the lack of moisture, Glycerin alone is a good remedy for this problem. Wash off the paste with clean water. You can follow this method on a daily basis for 2 or more weeks. Epsom salt is commonly known as Magnesium sulfate. It is an inorganic salt containing magnesium, sulfur and oxygen; a common remedy to heal cracked heels. It enables circulation which quickens the healing process. It also promotes skin health and it takes out the toxic elements from our body. In a bowl of warm water, add ½ cup of salt. Mix it well. Put your feet into that tub or bowl. Leave it for 10-15 minutes. With the help of a scrubber or a pumice stone, gently scrub your feet for 1-2 minutes. Soak your feet on the warm water for the next 10 minutes again. After that, clean your feet with clean water, dry your feet and the job is done. You can apply petroleum jelly on the cracked area if you like. It helps a lot. It moisturizes your skin to keep it smooth. For long term healthy feet, you should dip your feet in warm water spiked with glycerin every night. Try these simple steps to heal cracked heels. Avoid creams and medicines if not recommended by a doctor. If the problem still persists, we suggest you see a doctor and get your heels healed fast.